Happy holidays once again! 2005 saw a prodigious leap in the number of older genre films released, the kind of library product Savant dotes on. The mainstream of the industry reported a leveling-off of the DVD market, which to Savant simply means that most people likely to get addicted to the DVD habit already have, at least until we start implanting babies with DVD players at birth. With DVD now seriously competing with theatrical exhibition for audience attention, the great mass out there is more likely to wait a few months and rent most of the mundane new pictures being offered, buying only gotta-have titles and old personal favorites. Going to the movies will become a special event rather than a frequent habit. In rural areas it’s practically gone already. The deeper penetration into the studio libraries is simply the majors’ effort to maintain full release schedules. 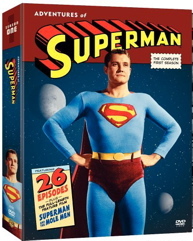 We see a great many repeat discs, either remastered a second time to yield better results or with a raft of special extras tagged on to justify double-disc special editions. Many of these are indeed special, whether the disc is a first-time release or not. 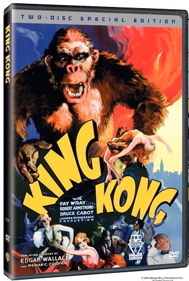 Nobody’s going to argue when the 1933 King Kong gets dee-luxe treatment. On the other hand, it’s also true that we’re frequently given special editions thrown together with little regard for anything but a long list of ‘goodies’ to print on the back of the box. Criterion still leads the pack in the quality and integrity of their extras but their price point separates them from the rest of the general competition. Some studios have been turning to smart outfits like Sparkhill and Crest Media to produce well researched and expertly mounted featurettes for their library titles. But there’s also a trend toward ragged little docus (producers to be unmentioned) that merely paste together quickie bites and pretend they’ve covered a subject. Commentaries and interviews with film historians can be fine, but when these experts are cut together as if they were celebrities in their own right, something suffers. There’s no substituting involvement by someone with a real connection to the movie, even if it’s a surviving bit player. This is why it grieves Savant to see so many serious docu opportunities ignored. 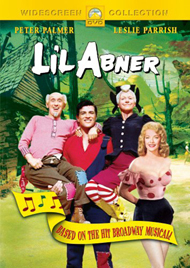 By now the makers of the films of the 50s and 60s are quickly passing away, yet there’s little concerted effort to get their comments on record. 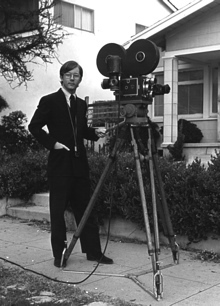 As far back as the late 1960s Kevin Brownlow began filming an audiovisual history of silent film personalities practically single-handedly, but his great example hasn’t been followed much. To my knowledge, only TCM/Warner Bros. has methodically interviewed actors and directors from later decades. Before we criticize studio-produced featurettes too deeply, there are some things about them that need to be understood. Legal and marketing restrictions make really good extras on old movies the exception to the rule. Want to show clips from other movies to make a point? No way, they need to be licensed. Want to compare a film musical to its stage roots? Stills and music clips not already owned by the studio also need to be licensed. 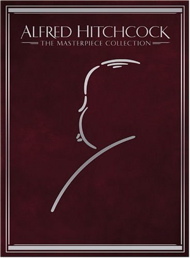 Even if one finds special material in private hands, more often than not a collector must essentially give it to the studio if it’s to be included. Want to tell the truth about minor disharmony on the set or controversy over credits? Think again. Savant found this out while writing some liner notes last year. Even though they were supposed to be outside opinion from a non-studio source, they were vetted to adhere to a studio point of view. I was asked to alter my opinions to favor the studio’s image. But I started out saying that Library Releases are getting broader and deeper, and not a week goes by without a new release that makes putting a disc in a DVD slot an exciting experience. Warners generated a tall stack of themed boxed sets this year, a bounty of great vintage films aligned along genre and star themes. 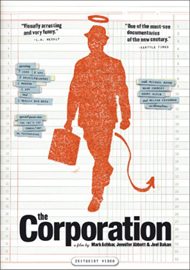 There was even a challenging boxed set revolving around “Controversial” films through the decades. Extras have always been a deal-sweetener but like most old-movie fanatics Savant goes for the title first. If it’s a good movie and the transfer is acceptable the disc producer’s basic promise is fulfilled. There were so many great library releases this year Savant has given up even the pretense of objectivity in choosing a ‘best of’ list. I’ve already been calling it the ‘most impressive’ list for two years running, with a dozen or so special titles of note followed by scores of worthy releases. This year’s top ten are simply personal favorites, the ones that meant the most to Savant or that I’d unconditionally recommend. Never heard of a particular movie? Take a chance. The top ten are followed by a horde of titles of equal interest. Yes, it’s the same old mix. Savant is crazy about horror films, arcane science fiction and film noir with a healthy dose of old mainstream fare with values that still appeal. Euro-horror has all but dropped off the charts for Savant this year. With some desired classics still AOL, we’re bombarded by lesser slasher thrillers from the 1970s. The adventurous Mondo Macabro, Blue Underground and Synapse labels continue to bring out all manner of exotic sleaze from the far corners of the world. With a few exceptions they just aren’t Savant’s taste, and Savant still finds little enthusiasm for cult auteurs such as Jésus Franco. As Greg Jein once lectured me, if you eat enough of a certain substance, it starts to taste good. And then where are you? 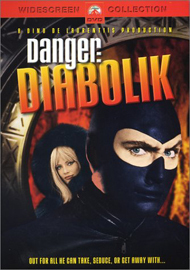 Bragging rights this year go to Paramount‘s Danger: Diabolik. Mario Bava’s super-criminal comic strip is a visual mother lode of color-saturated comic-book dynamism. We had no right to expect more than a revisit of the compromised laserdisc presentation from ten years ago, and were delighted when Paramount allowed producer Kim Aubry and Zoetrope to put together a great combination of improved picture, recovered original soundtrack and surprising extras that include a commentary with Tim Lucas and (“Ummmm – moo-oo-ha ha hah HAH HAH!”) Diabolik himself, John Philip Law. 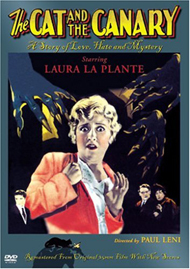 There’s no denying the significance of Warners‘ The Val Lewton Collection, which gathers together all of the legendary producer’s horror hits of the war years: The Cat People, The Leopard Man, I Walked with a Zombie, The Seventh Victim, The Curse of the Cat People, The Body Snatcher, Isle of the Dead, and Bedlam. 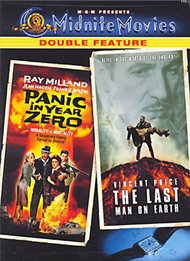 This unique set of creative chillers combines the best of RKO’s artisan-based production values with a sensitivity seldom seen in Hollywood, and remains an oasis of terrific filmmaking in an artistic desert. Several of the pictures have excellent commentaries from Greg Mank, Kim Newman, Steve Jones, Steve Haberman and Tom Weaver, with choice archive recordings from the late Robert Wise and Simone Simon. 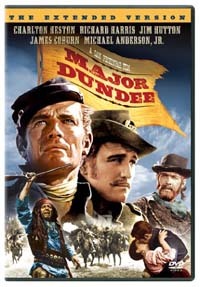 Major Dundee is here because it simply has to be; last year Savant was floored to learn that his favorite research film, one of the most-ignored studio epics of all time, was being given a new lease on life with twelve additional minutes of scenes and an alternate (as opposed to ‘replacement’) score that finally allows one to appreciate the story being told. Mangled, mutilated and still not a really great picture, Sam Peckinpah’s first attempt at a broad canvas has to be chalked up as a magnificent effort. Sony‘s restoration VP Grover Crisp oversaw the rebirth of the picture and unearthed some interesting outtakes. 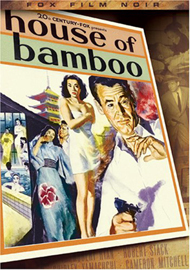 Mike Siegel’s featurette has interviews with stars James Coburn, R.G. Armstrong and Senta Berger. Let’s hear it for unsung sleeper films waiting for rediscovery. 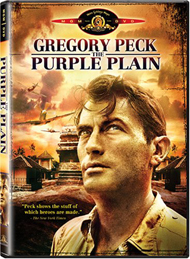 Robert Parrish’s 1955 The Purple Plain is a modest war-related drama with Gregory Peck as a flyer in Burma on the brink of a nervous collapse. He has a hope of redemption in the person of Win Min Than’s meek and soothing Anna – and then finds that he needs all the sane judgment he can muster to survive a brutal jungle ordeal. Brilliantly adapted from a book by Eric Ambler, the picture is a fine portrait of a man operating at extremes, and its quiet, hopeful conclusion puts many ‘art’ films to shame. 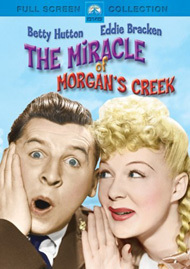 One of the last discs out the door before MGM was sold to a consortium. 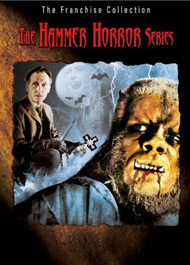 To the amazement of horror film fans, Universal kicked off the Halloween season by putting out the studios’ entire Hammer Films holdings in one release. Whereas other companies have difficulty managing decent encodings of single features, Uni’s The Hammer Horror Series looks great, with eight titles spread across two double-sided double-density discs: The Brides of Dracula, The Curse of the Werewolf, The Phantom of the Opera, Night Creatures, Nightmare, Paranoiac, The Kiss of the Vampire and The Evil of Frankenstein all look terrific, with only a couple of quibbles over aspect ratios and attendant anxiety when some flawed production runs ended up going out to consumers. Night Creatures alone was worth the purchase price as even many Hammer die-hards had never seen it. And the enhanced widescreen transfers help make flawed efforts like the Herbert Lom Phantom look their best. In one fell swoop Universal has drastically reduced the number of desired but unreleased chillers from the Boys of Bray. 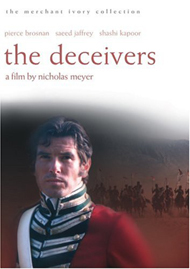 The Merchant Ivory Collection in conjuction with Home Vision Entertainment and Criterion has put out practically everything by the Ismael Merchant/James Ivory team, but we got a surprise last year with the release of The Deceivers, a bizarre action / mystery thriller set among the Thugee cult of 1820s India. Why this movie wasn’t a hit totally eludes Savant, as it has Pierce Brosnan enmeshed in a fascinating conspiracy of strangling murders. In some of the weirdest genre-bending scenes ever, an adventure tale becomes psychedelic horror when Brosnan’s undercover agent takes the cult’s ‘holy drug’ that reportedly steals one’s soul. It’s obvious that Warners‘s King Kong 2-disc Special Edition is timed to coincide with the terrific new Peter Jackson remake, but the attention lavished on this disc honors and celebrates the magic of a cinematic original. A splendid new restoration is accompanied by Kevin Brownlow’s docu on Merian C.Cooper and an ambitious set of featurettes by Sparkhill and Peter Jackson’s Wingnut crew. One segment includes a fanciful ‘reconstruction’ of the lost Spider Pit scene completely re-done using Willis O’Brien’s 1933 technology. 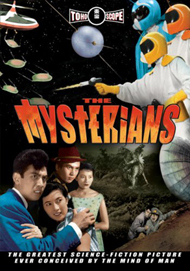 What Japanese fantasy nut could resist Chikyu Boeigun, aka The Mysterians? Decent video on Toho science fiction is rare in the U.S. and Media Blasters‘ ambitious Tokyo Shock line inaugurated a new push with this 1957 “red-blooded phantasmagoria.” The space pirates claim they only want a few acres and some females for procreation, but who trusts invaders wearing helmets that make them look like evil parakeets? Furious battles erupt when the Japan Defense Forces fight back, with a little help from handy Yank Atomic Cannon and exotic weapons called Markalites. Flying saucers! Giant tunneling robots! Impregnable Battle Domes! This ‘war of the worlds’ has everything needed to warm the heart of an eight year-old. 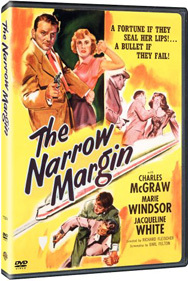 The Narrow Margin is merely the best of a bumper crop of great films noir released last year. 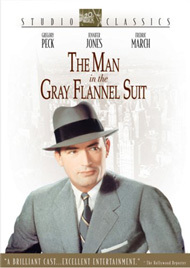 A second noir set from Warners was joined by a series from Fox and scattered winners from other studios as well. Richard Fleischer made his reputation directing this fast-moving, smart-talking claustrophobic suspense thriller set on a moving train. The snappy dialogue comes fast and slick as tough cop Charles McGraw trades insults with Marie Windsor’s gun moll, and clever technical tricks mimic the tight quarters of a moving train on the RKO sound stages. 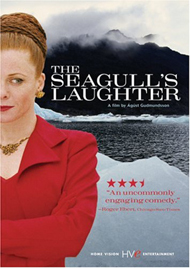 An excellent film with which to interest people in old B&W thrillers. 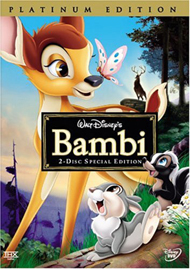 Disney’s Bambi shows the Mouse Factory’s classic animation talents at their best, transcending every known limit of the animated feature. The story of the first year in the life of a baby fawn introduces kids to the harsh facts of nature and inspires an appreciation for the mystery of life. Adults are equally captivated, as Bambi addresses the core question of why we have those kids in the first place. Detailed extras show the old Disney operation to be a font of creativity unconcerned with almost all of the studio idiocy that restrained good work then and often makes it impossible now. Savant checked the tally: In the last 12 months I’ve written just under 400 reviews, averaging more than one a day. And I enjoyed most of the films I saw, with only a few disappointments hanging in the memory. I’d been hoping for years to catch up with Nicholas Ray’s Bitter Victory, only to find it nowhere near as good as its reputation. I was also badly let down by the poor transfers of the following, for wildly different reasons: A flimsy disc of The Day of the Triffids will hopefully become extinct when the true rights holder releases a deluxe restored CinemaScope version, anticipated for sometime late in 2006. In Search of the Castaways was only one of several Disney live-action favorites given a crummy “who cares?” DVD presentation. Fox’s Oklahoma! special edition played perfectly until we got to a truly car-wreck transfer of the Todd-AO 30 frames-per-second version. That debacle was probably a case of good intentions scuttled by bad luck; there have already been rumors of a possible quiet replacement program later in 2006 that I’ll be quick to report on if it comes to pass. And finally, a color-challenged, insufferably grainy disc of Zulu Dawn practically broke our hearts. Originally a Panavision film with a full Dolby surround track, this one screams out to be redone in a decent version, with extras to explain its amazing production. Savant’s actually very grateful for the opportunity to spout his opinions in a personal forum and pleased that some readers have found said opinions to be a useful barometer when taking steps into the unknown territory of DVD acquisition. (That’s Savant – “DVD Acquisition Enabler-Consultant, Esq.”) This wouldn’t work if I weren’t every bit as google-eyed about old movies as the next fellow. Last year I made a couple of predictions on releases and was wrong only in that Criterion brought out the Archers’ The Tales of Hoffmann instead of A Canterbury Tale as I had been led to believe. Right now Savant has classic westerns on the brain. I knew the release date of Warners’ Sam Peckinpah Boxed Set six months ago but remained mute so as not to jeopardize the friendly flow of that label’s hot titles. That superduper disc set is only a few weeks away and Savant is already getting a serious Peckinpah itch. After it appears, I think all that will remain unreleased from Bloody Sam will be The Deadly Companions (I don’t count the unwatchable Pan-scan cheapo discs), Noon Wine and perhaps Cross of Iron (at least in Region 1). There are rumors but still no sightings of the three Sergio Leone double-disc special editions Savant helped finish over a year ago, which were released in Region 2 but not here: Fistful of Dollars, For a Few Dollars More and Duck, You Sucker. I hope they’re not forgotten, as they were a big emotional investment. I also heard a rumor about another attractive Western boxed set, another rumor I don’t feel comfortable talking about yet. Maybe closer to street date.